Deciding on the right reefer management solution requires a lot of planning. From the tracking device, to the web interface that provides the analytics and reports, to integration with dispatch systems, there are many aspects to consider. But without a doubt the most important aspect you should consider is whether you are going to derive enough return on investment (ROI) to justify the solution. 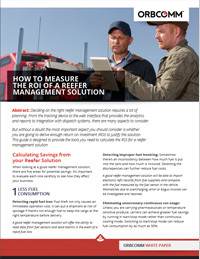 This guide is designed to provide the tools you need to calculate the ROI for a reefer management solution. It will explore five areas for potential savings and the importance to evaluate each one carefully.